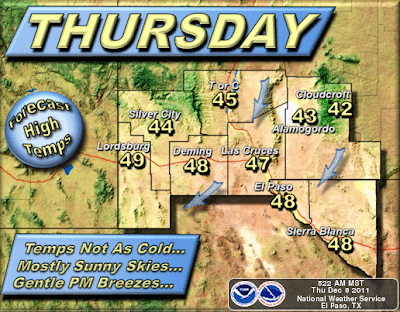 Brief Warm-Up Today-Cold Fri & Sat. New Daily Record Low-Max Temperatures. (These Are The High Temps For Tuesday). New Daily Record Low Temperatures. (24 Hr Period Ending At 7 AM 12-7-2011). (These Are The Low Temps Reported Wednesday Morning). 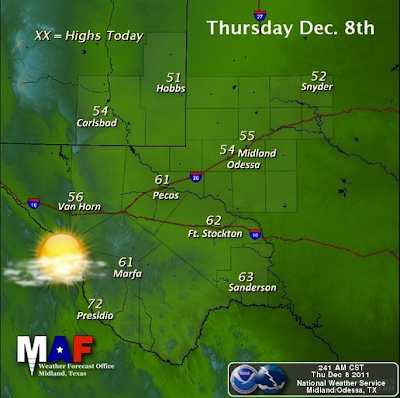 Sunny skies along with warmer temperatures will rule our weather today. National Weather Service forecast high temperatures range from 42 in Cloudcroft, 44 in Ruidoso, 45 in Roswell, 51 in Artesia, and Hobbs, to 55 in Carlsbad. 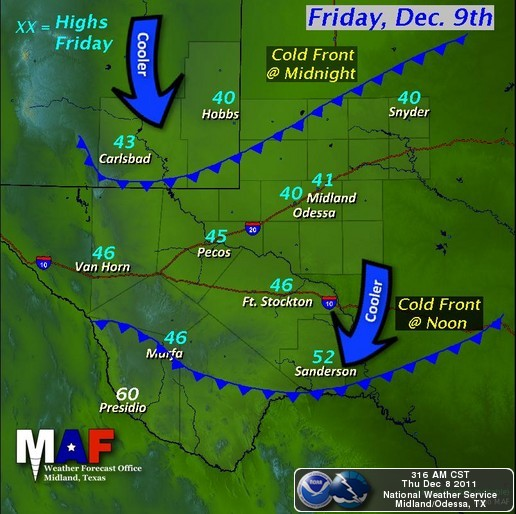 A cold front will enter the area tonight, so colder weather returns tomorrow and Saturday. Our National Weather Service forecast highs for Friday range from 34 in Cloudcroft, 36 in Ruidoso, 37 in Roswell, 40 in Hobbs, 41 in Artesia, to 43 in Carlsbad. Similar readings are anticipated for Saturday, maybe a few degrees warmer. Low clouds will return to the area on Friday but at this time no precipitation is in our local forecast. Long-range models continue to struggle with next weeks potential mid-week winter storm that could impact the state. The GFS model brings the upper-level storm across the state on Tuesday. The Canadian (CMC) model moves it across on Wednesday, and the European (ECMWF) model drags it across New Mexico on Wednesday, with a second upper-level low following quickly on its heels for Thursday. Normal & Record Climate Data For Dec 8th.